Serving as the cornerstone of the exhibition, papal robes and accessories from the Sistine Chapel sacristy, many of which have never been seen outside The Vatican, will be on view in the Anna Wintour Costume Center. Fashions from the early 20th century to the present will be shown in the Byzantine and medieval galleries, part of the Robert Lehman Wing, and at The Met Cloisters. Spanning 25 different galleries, visitors to the Metropolitan Museum of Art’s forthcoming costume institute exhibition, Heavenly Bodies: Fashion and the Catholic Imagination, can expect to see the most ambitious exhibit the institution has ever taken on, revealed its curator Andrew Bolton on Monday at a press conference in Rome. While the exhibition opens at the gallery’s costume institute in New York in May, its links to the Italian capital are strong with the Vatican loaning around 40 ecclesiastical pieces for the exhibit. Bolton is said to have already visited at least 10 times to secure pieces, including a papal tiara comprising 18,000 diamonds and items worn by Pope Benedict 14th in the 1600s. 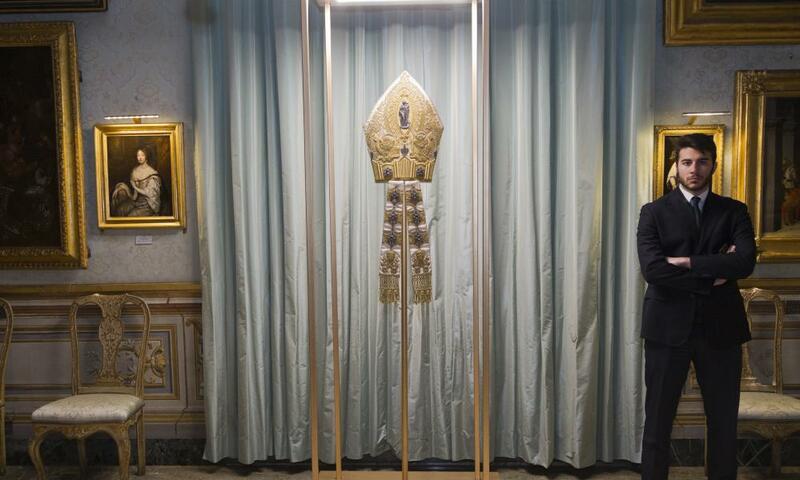 These pieces, some of which have never left the Vatican’s sacristy before, will be shown along with 140 pieces from fashion houses including Dolce & Gabbana, Versace, Chanel and Valentino. The theme of this year’s exhibit may prove to be one of the institution’s most controversial yet, with questions raised about how Bolton will navigate the presentation of holy artefacts alongside more abstract and conceptual creations from fashion designers without causing offence. Bolton, who acknowledged that some may consider fashion a questionable medium with which to engage with the divine, drew parallels between the world of religion and fashion, such as the ceremonial qualities of a fashion show compared to a church service. He also said the religious artefacts would be displayed alongside works of art and separately to the fashion garments. Wintour is also co-chair of the Met Gala, which officially cuts the ribbon of the exhibit. The event, which was the subject of the 2016 documentary, The First Monday in May, is regarded as the Oscars of the fashion industry, with famous guests walking the red carpet in creations they feel best represents the theme. Wintour, however, thinks that this should only act to raise interest in, rather than detract from, the main event. “I want [red-carpet guests] to understand the importance of the exhibition,” she continued. “Of course the party is always fun and it’s great to see what everyone is wearing, but [it serves] to put the spotlight on the exhibition. We’re so proud of the numbers and the different audience we bring in.” The annual event is the main source of funding for the costume institute’s exhibitions, publications and acquisitions. The last time the Vatican lent pieces to the Met, it was for The Vatican Collections exhibit in 1983 which Carrie Rebora Barrett, the deputy director of the Met, said remained the third-most visited exhibition in its 148-year history, showing the veneration held for such subjects. The exhibition will run for six months instead of the usual three, giving plenty of time for the Vatican to match its previous record.